Vishwakarma is the lord of Architect. Vishwa karma is also known as the creator of the world or universe. He is the real architecture of the universe. Vishwakarma Puja or Vishwakarma Jayanti is one of the famous festivals of eastern part of India. Mainly it observes in Tripura, Jharkhand, west Bengal, and Orissa etc. Vishwakarma is identified as the heavenly engineer of the earth. It is habitual for craftsmen to adoration their tackle in His name. 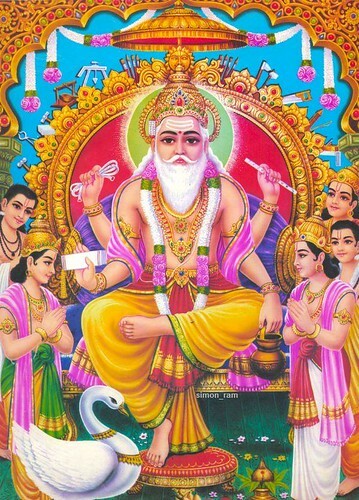 During festival of Vishwakarma Jayanti or Vishwakarma Puja, Lord Vishwakarmaji is worshipped by smiths, craftsmen, Artisans, mechanics, Weavers, industrial workers, welders, factory workers etc on this day for accomplishment in their respective fields. On Vishwakarma Worship it is habitual to place particular idol of Vishwakarmaji or pictures or Photo of Lord Vishwakarma at each factory and other workplaces. All workers congregate at a general place for worship the deity of lord Vishwakarma. Vishwakarma Puja observe each year when lord Vishwakarma appeared to architect earth. this festival is mainly celebrated by whole communities of workers and professionals.